“It seems that gun control laws is the major topic of conversation rather than focusing on the bigger issue of 17 innocent lives being taken,” Brandon Minoff told Fox News Tuesday. Brandon Minoff, 18, and his brother Aiden, 14, survived the Parkland school shooting. The older brother told Fox News Tuesday that he has a problem with the way the news media has covered the tragedy. "I know many people who are pro-gun and others who support gun control but it seems that the media is specifically targeting those in support of gun control to make it seem as if they are the majority," Brandon told Fox News. "And the liberal news outlets are the ones that seem to make the bigger effort to speak to these people, and I'm talking from experience." Several of Minoff's classmates have taken to television and print to call for gun restrictions. Some have even gained enough of a following to draw the ire of conspiracy theorists. But Minoff told Fox he doesn't believe viewers who only see pro-gun control students are getting the whole story. "All day Thursday, CNN was interviewing gun experts and specialists to brainwash the audience that gun control is a necessity," Minoff told the network. "They even have an army of my classmates trying to persuade other students that guns are unnecessary and should be illegal." Minoff went on to tell Fox that he believes lawmakers should look at putting more armed guards in schools to prevent further tragedies, and that he supports more thorough background checks for gun purchasers. But Minoff also said the discussion of policy shouldn't distract from remembering the 17 people who were lost on Valentine's Day. "It seems that gun control laws is the major topic of conversation rather than focusing on the bigger issue of 17 innocent lives being taken," Minoff said. The Tuesday interview wasn't Minoff's first brush with the news media. 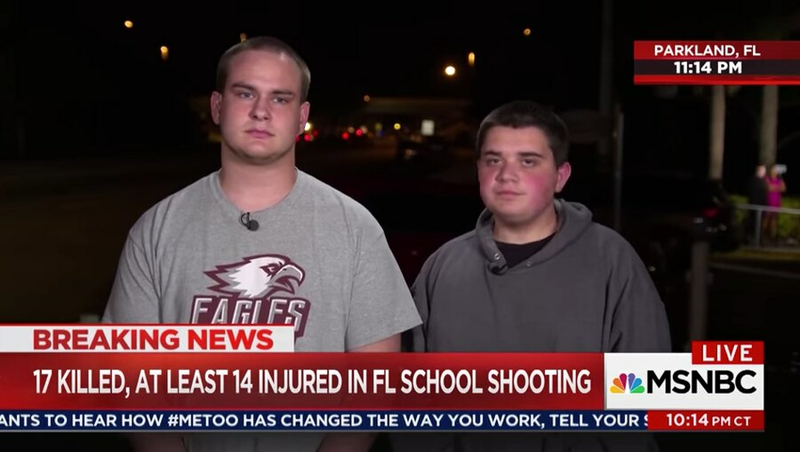 The night of the Parkland shooting, Brandon and Aiden were interviewed by MSNBC's Brian Williams. Brandon told Williams he didn't believe gun control measures would have prevented the tragedy he'd just experienced. "Gun wise, I don't think there's any way to prevent it. You outlaw guns, it just creates higher demand for it. I think it has to do with mental health, though." Watch that entire interview below.